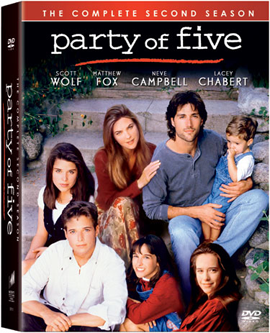 YouTube Takes Aim At Hulu With "Party Of Five"
YouTube announced today new measures it is taking to more prominently feature and broaden the range of content available on the site from studios including Crackle/Sony Pictures, CBS, MGM, Lionsgate, Starz, the BBC, Anime Network, Cinetic Rights Management, Current TV, Discovery, Documentary Channel, First Look Studios, IndieFlix, National Geographic. The site will now feature a new ‘Shows’ tab in the YouTube masthead, which will allow users to browse through television content by genre, network, title, and popularity (sounds like Hulu, doesn’t it?). The site now features thousands of full TV episodes, as well as hundreds of movies. Some videos will be available in HD. At this point the majority of content will come from older TV shows and movies – series like ‘Party of Five’ and ‘Married With Children’, not the current seasons we’ve been seeing on Hulu. But more deals are in the works, and I suspect that barring a disastrous response to YouTube’s premium content we’ll be seeing newer show in the next few months. The site is also refining its search options, making it easier to separate the new premium content from the user-generate videos the site has become famous for. 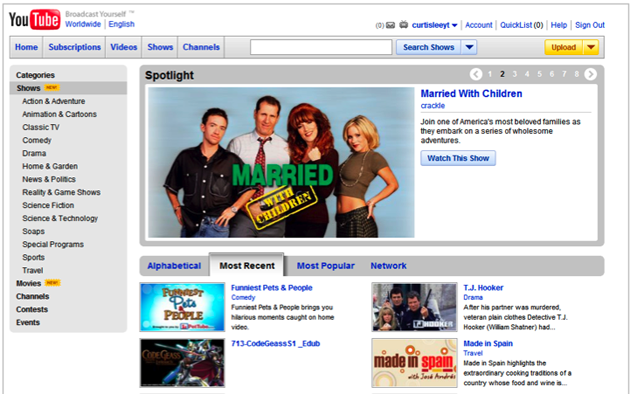 We’re excited to announce the beta launch of Google TV Ads Online. This is a new feature of Google TV Ads that lets advertisers place commercials into the ad breaks of TV programs watched online. It works in the same way as Google TV Ads: advertisers can target specific programs and select their cost-per-thousand (CPM) bid. Based on their targets, budget and bid, ads are inserted in the same program breaks that were designed for advertising when the programs first aired. (Ads may also be shown “pre-roll”, before the program begins, or after the online presentation of the program “post-roll.”) And like Google TV ads, we provide advertisers with measurement tools that give greater insight into how their ads perform with users.